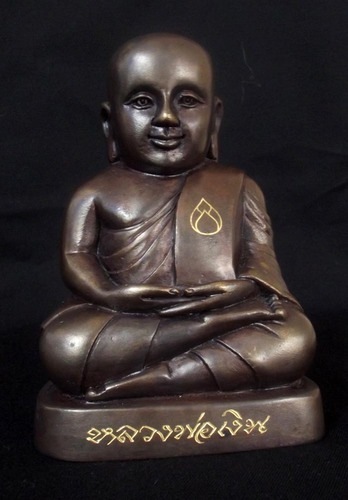 Luang Por Ngern Wat Bang Klan Bucha Statue – Comissioned and Sponsored by Luang Phu Kambu, and Blessed in Putta Pisek Empowerment ceremony for the ‘Run Pokasap’ edition of amulets at Wat Gut Chompoo in Ubon Rachatani. 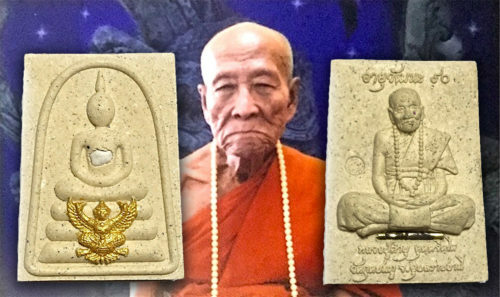 The series was exclusively Luang Por Ngern Amulets, with the Bucha Statue, and the ‘Chor Pra’ (a tree with multiple amulets attached – the ancient method of casting amulets. One whole casting tree), and some Loi Ongk Luang Por Ngern Statuette amulets in various Sacred Metals with Solid Gold version being the Top of the Range. 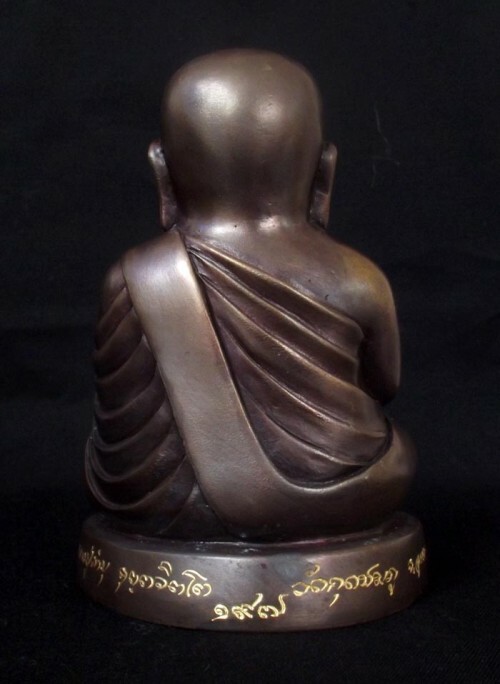 This Bucha Statue is made from a Sacred Bronze ally made from smelted ancient Buddhist artifacts and Luang Por Ngern Amulets of previous editions. 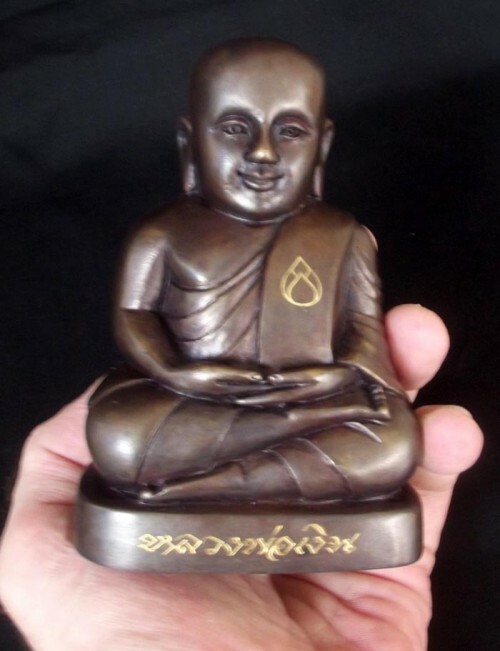 A First Class Piece of Fine Buddhist Sacred Art that will grace the Altar with its Majesty, and bestow Blessing upon those who Pray, and those within Your Household or Private Temple. The Pid Ta have a Kring Bead inserted inside them (Sacred Rattle), and are thus not only Pra Luang Por Ngern, but also ‘Pra Kring’ amulets. The Statue has some hair of Luang Phu Kambu, Puttakun Powder, and a Sacred Kring Magic Bead (Rattle) inside the base of the Image. Perform Bucha to Luang Por Ngern on Tuesdays, Thursdays and Fridays. Offer Lotus or Jasmine flowers (9 flowers), three rolls of Areca Nut with Betel leaf – place on a tray along with 9 Incense sticks, one pair of candles. Place them in front of Luang Por Ngern, and Pray for the Protection and Help of Luang Por Ngern, to Prevent enemies from Harming, Avoid Accidents, and to Increase Good Business and Wealthy Fortunes. 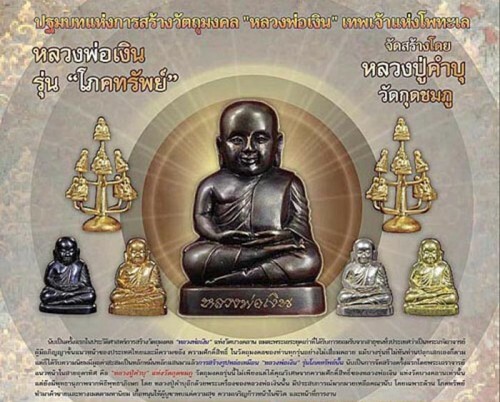 The Magical Effect of Wealth Increase is one of the Famous Aspects of the Many Blessings that come from Revering Luang Por Ngern of Wat Bang Klan, the Miraculous Image that has been the source of many stories of Miraculous Events, that have happened with a great many different editions of Luang Por Ngern amulets from a number of Masters. 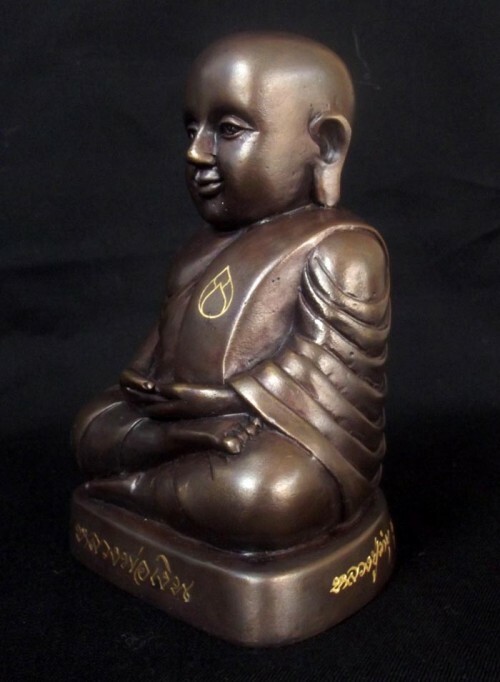 The special Magic of Luang Por Ngern makes the effects work regardless of the Temple or Master who creates the edition, for it is believed, that the Image of Luang Por Ngern has Special Magic in itself.